Central West Queensland is a vast area. Bordered by the Northern Territory and South Australia to the west the region covers about 400,000 square kilometres but is sparsely populated. Towns such as Longreach, Winton, Birdsville, Blackall, Barcaldine, Boulia and Muttaburra help to tether this strong agricultural district, dogged by drought over the centuries. Partly criss-crossed by the waterways and rivulets that make up the famous Channel country, this region was the birthplace of the blue singlet. The shearer’s ‘Jacky Howe’, that epitome of hard work and bush life. It was also here that it’s said Banjo Patterson spurred on by a regional story, penned our unofficial anthem, Waltzing Matilda in 1895 while staying at a homestead just outside of Winton. The town has a ‘Waltzing Matilda Centre’ dedicated to the mythology and history surrounding the ballad. 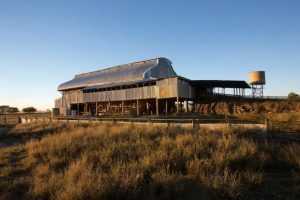 The ‘pioneering spirit’ of early white settlers is celebrated at Longreach’s Stockman’s Hall of Fame, while Barcaldine commemorates Australian Workers at their Heritage Centre. Sheep lie at the heart of the areas early history and almost every town in Central Queensland was dependent on the white gold that offered employment, from the shearer’s, rouse-abouts, stockmen and bullock-team drivers to the plants so necessary for the washing and processing of wool. The numerous wool sheds in the region created a massive demand for boiling and scouring plants. The Blackall Woolscour, established in 1908 was steam-operated. With its retirement in 1978 it quickly became a historic site and I believe remains the only complete example of its kind left in Australia. If you’ve been to Longreach and this is just one example, you may have commented on the width of the roads. This was so bullock teams pulling wagons piled with wool bales could turn in the main street if required. 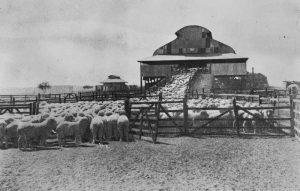 The shearing shed at Acacia Downs near Muttaburra apparently once served as the meatworks in Hughenden back in the 1880s. Brought to Acacia Downs during the first World War it sits high off the ground. Shorn sheep are pushed down chutes and wool bales are also dropped from a height flattening the ground below. With the space below there is no doubt plenty of room to shed sheep from wet weather before shearing. And with its lofty height, I suspect the shed would be reasonably cool to work in as well.